It is well publicized that cigarette butts are the most prevalent litter item found on US streets and beaches. Anyone who looks down as they stride Main Street or their nearest shoreline would agree. Not only are they unsightly, but their filters are made of a plastic, that, yep, never goes away! 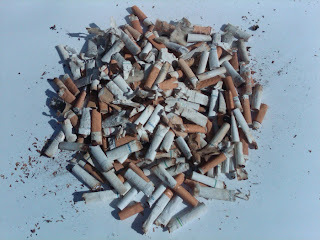 And now - as of a few months ago (confirming my ignorance), I was unaware of the deadliness that remains trapped within these tossed-aside cigarette butts - "they are just paper!" But a recent in-home science project (as well as sound university research) has proven that they are indeed more than "just paper." When welcomed by bodies of water (rivers, lakes, oceans), cigarette butts spew a deadly dose of toxins that no human (or fish) would want to swim in (let alone drink)! Ten days ago, I asked myself why I continue to walk the beach and pickup litter - when I could just walk outside my front door, pickup litter, and prevent it from even reaching the open ocean and (on limited occasion) eventually the shoreline. My good friend @easytowrite actually helped me realize this when he picked up enough litter to fill a large garbage bag - just on his residential street near Fairfax and Melrose in Los Angeles. This "urban cleanup" intrigued me even more when dealing with cigarette butts as it would prevent them from touching any water and leaching their nastiness at all. That day I walked towards the ocean on Ocean Park Blvd in Santa Monica from 7th Street until I reached the beginning of the sand at Santa Monica beach - Google puts it at about 10 blocks or 0.6 miles. I only picked up cigarette butts on one side of the street from either the gutter or sidewalk - 344 cigarette butts in total! I thought that was quite a lot - 57 every 10th of a mile! In Santa Monica, CA! I brought them home, counted them, and separated them into three piles: (a) fresh ones - still firm and round (b) weathered ones - flattened with fraying paper and (c) frayed filters. I then filled four Ziplock bags with three cups of water and placed 25 cigarette butts of type (a), (b), and (c) in the bags. I put nothing in bag four - my control. Magic began to happen right away. Smoke all you want people, but when you start killing fish - no bueno! 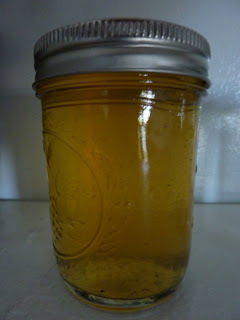 Here is a photo of the water from bag (a), four days after soaking. I filtered the butts out and transferred into jars. Today - 10 days after clearing Ocean Park Blvd of cigarette butts - I walked the same exact path and picked up 239 cigarette butts!! and most were of type (a) mentioned above - fresh ones. We as humans must evolve our culture and restore the connections to other living beings...Will this only happen when all the fish have been smoked out?! ?